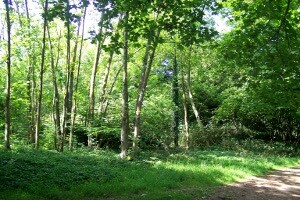 Brighton & Hove has several local nature reserves in and around the city. Our nature reserves provide wild spaces where plants and animals can thrive. They offer a natural environment, in contrast with formal open green spaces such as parks and gardens. 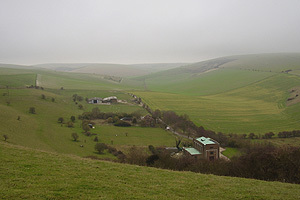 Much of Brighton & Hove is in South Downs National Park. 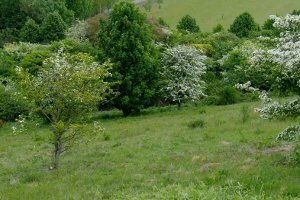 Over half of the area covered by Brighton & Hove City Council is open downland. Most of the coast of Brighton & Hove is also of national wildlife importance. Within the urban area, features such as the National Elm Collection and the network of natural habitats in urban green spaces are essential to the character of the city. These are highly valued by residents and visitors. Wild Park is one of Brighton & Hove's largest nature reserves and has extensive woodland walks and spectacular views over the city. The South Downs National Park extends right into the city here. Important species-rich chalk grassland survive on the south and north-facing slopes surrounding the recreation ground and on the roughs of Hollingbury Park golf course. 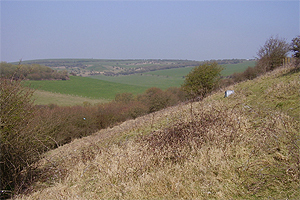 Waterhall conservation area is about 15 hectares (38 acres) of chalk downland and scrub. It lies between the golf course to the west, the rugby club to the south and farmland to the north. It is an important recreational resource for the local population with its woodland walks and wildlife. It is also in the South Downs National Park. 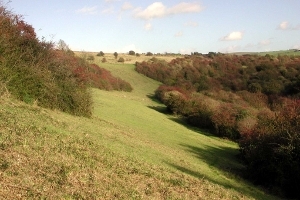 Bevendean Down is a cluster of south and east facing slopes. It consists of species-rich chalk grassland, scrub and woodland. 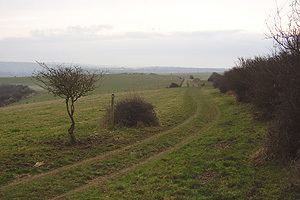 The Bevendean Down nature reserve is in the South Downs National Park. From the top of Whitehawk Hill there are panoramic views over the city to the downs and the sea, including the Isle of Wight on a clear day. 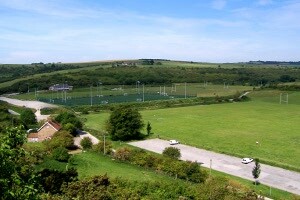 Whitehawk Camp is near the top of Whitehawk Hill. It lies between a large communications mast and Brighton Racecourse grandstand. Whitehawk Camp is a site of archaeological importance. It is the first Scheduled Ancient Monument (SAM) in Sussex. 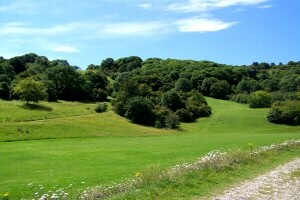 Castle Hill is an area of rich chalk grassland owned by Brighton & Hove City Council. Castle Hill is in the South Downs National Park. In 1975 46 hectares (114 acres) were designated as a National Nature Reserve (NNR). Castle Hill is managed for the council by Natural England who arrange for it to be grazed locally. A cluster of small woodlands along the London to Brighton railway line from Preston Park station north to Coney Hill. Withdean Woods are a Local Nature Reserve (LNR) and a valuable wildlife corridor in an urban area. The mature woodlands support a rich variety of trees including large beech, yew and holly. There is a diverse woodland bird community and native woodland ground flora in places. The site is maintained by The Withdean, Westdene Woods & Eldred Avenue Copse Keepers (TWWEACK). See where Withdean & Westdene Woods Local Nature Reserve is on a map. Benfield Hill is our oldest Local Nature Reserve (LNR). It was declared a local nature reserve in 1993, and is in the South Downs National Park. There are gentle and more steeply sloping areas facing south and east which support chalk grassland and scrub. The LNR also supports a large population of glow-worms. For more information read the Benfield Hill Management Plan 2011-16 (PDF 2.2MB). See where Benfield Hill is on a map. Beacon Hill is a Local Nature Reserve (LNR) in the South Downs National Park supporting a range of plants and butterflies associated with chalk grassland, and includes Rottingdean Windmill. The LNR is owned and managed by Brighton & Hove City Council and is supported and advised by Beacon Hill Management Committee. The area being grazed on Beacon Hill [PDF 680Kb] is the top of the hill which will be grazed in several separate sections. There is also a new leaflet covering East Brighton (PDF 811KB). See where Beacon Hill is on a map. 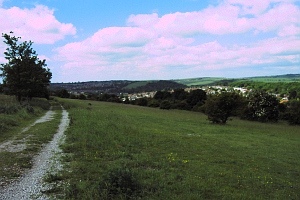 Ladies Mile is a Local Nature Reserve (LNR) stretching from Ladies Mile Road in Patcham up to the top of Carden Avenue in Hollingbury. It is an important green corridor linking with Stanmer Park to the north east. Typical chalk grassland species include large areas of Horse-shoe Vetch and Kidney Vetch. There are also areas of scattered and dense scrub on steeper slopes and a small woodland at the southern end of the site. See where Ladies Mile is on a map. The maps on this page show the location but not the boundary of the sites.